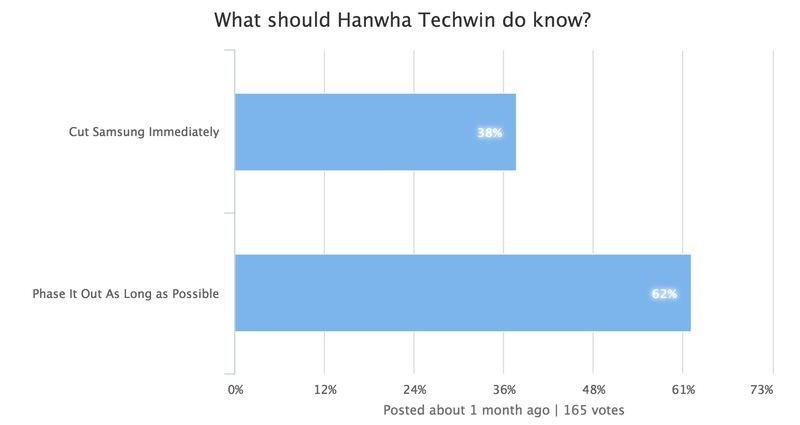 The video surveillance manufacturer formerly known as Samsung; 100+ integrators told IPVM how they felt about Hanwha Techwin. *** ***** ************ ************ ******** ***** ** *******; ***+ *********** told **** *** **** **** ***** ****** *******.  ******** ** ***** ********** ***** ********* (*****, *********, ****), ****** did ****** *** ** ********* **** ** ****** *** ******* brand, ** *** ********** ********** **** ***** **********. "**** ***** **** ***** ** *** *** ******* ****." "***** **** ****** **** **** **** *******. *** * **** recognized ****." "* ***** ** * ******, ****** **** ** *** *******"
"**** ******* *** * ********** *****. *** ******** *** ******* move **** ** ******** *** ******* ****." "*****'* **** ****. 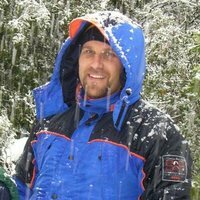 *** **** ****** ** *** ***** **** changed *** ****. *** ** **** ** ****." "****** *** ******* ***** *** **** ****. ***** ****** *******, but **'* ********** ****** ** **** ******* *** **** ***********." "**** **** **** ******* **** **** *** *** ****." "******* *** *** **** ********* **********, ** *** *** **** to ******** ********* **** **** **** *** ** ********** ** the ** ******** *****." "********* ***** ** ******* **** *** ******* ******* ***** ** wary." "******* -> ******* -> ******... ******** ******* *** ******* ****. Who ***** **** ********?" "** **** **** **** ** *** ******* **********, *** ** was **** ** **** *** ******* ****. *** *** ****** and ********* **** ******* *** *** *** ****** *** *** future **** *** *** * *** ** ********* ***** *** them." "*** ***** ******* ****** ******* ***** ******** ** *** ***** frankly ****** ** ***." "***? ******* **** **** **** ******* *********** ***** *** ******* and ******** *** **********." "********* ****-*** ******* ***** *******. *** *** *****, ****** ***** relative *******. **** **** ** ******* ********** ***** **** **** years." "*** **** ** ****** ******* *** * ****-**** ***********." "**** ***** ******** ***** **** ******* ******* **." "***** ***** ** **** *** ***** **** ****. ****** **** a ******* *****, ***** ** ***** ******* ********." "** ****. *** *** **** ** *** ******* ***** ** not ** ***** ****." "**** *** *** ******* ********* ** ******** *** ** ******** security ******." "* ***'* **** ***** ********." "***'* **** **** ***** ****." "*****/******* ***** ***** ****, *** * **** ***** ** *******. Many ******** *** **** ******." "*** **** *******, **** **** **** *******, ***** ******* **** quality." "**** ***** *** *** *****, ********* ** ***** ******." "**** ******* *** ********* ***** ***********. ***** *** * *** higher **** *** ****** *******." "** **** **** ******* / ******* ******* **** ** * secondary **** ** *** **** **** ******** *** * *** years. **'* ***** ** ********* ***** **** ** ***** **** is *** *********." "*****'* * *** ** **** ***** ******. ****'** ********** **** everything, ****** *************, **** **** *** ********, **** **** **** us ** *** ********. **** *** **** * ****** ********** - **** ******** ** ************* - *** ****** ***** **** overall ***** *** **." "**** **** **** *** * **** ***** *****. **** * nicely ******* ******* ****. *** ** *** ****** ******* **** products." "****** ******* ***** ******* ******* **** ** *** ***** *** the ******* ***** *** ** *********." "**** ***** *'** **** ** *** ********...********** *** *** ***** point." "**** ******* *** * ********** *****." "**** ******* ************* ******. ** ** *** **** *** *** 1/3 ** *** ***** ** ** ****** ***** ** *** Chinese *** **** ******** *** ******* *** ***** ** ****** Chinese." ******, ******'* ******* ** *** ** *** ******* ** ******* products. ***** ** *** ******* **** ***, *** *********** ** premium ***** *** *** ****** **** *** * ****** ***********. "*** ************ ********, *** *** **** *****, *** *** **** technology." "**** ******* ************, ******* ** *** ****." "***** **** ** - ** ********** ****** ** *** **. Not ******* **** *********, *** ***** ** *** ****** ******** than ****." "**** *** ****** ******* ***** *** ** ***'* **** **** as ******* ***** *** ***** ******** "** ***** ******", ** it ** *** ******** ** **** * ****** ****** **** them." ******'* ***** ****** ******* * *********** *********. **** ***** *** using ******* ********* *** **** ************ ****** ** ***** ****** ***. ******* ** ****, ****** ***** ** **** **** **** an ******** ***** (*** '****-********') *** ******* *********** **** ********* to ****** **** ***** ****. ** ****, ***** ** ** easy *** ***. * *** ****** **** ** *** **** ****** ********* ** willing ** ****** **** *** ***** ************ ******** *** *** camera *********** *** *** *********** * *** ***********. **** ******* to ** **** *** ** ********* ***** ******* *** ********** they *** ****. A battered Samsung is still far more valuable than a brand virtually unknown outside of Korea. By definition, branding is a matter of opinion but the survey results show clearly opinion is pro-Samsung branding vs Hanwha. Even though everyone taking the poll knew that the Samsung brand was being phased out a clear majority favored phasing it out as long as possible, showing overall strength of Samsung brand. 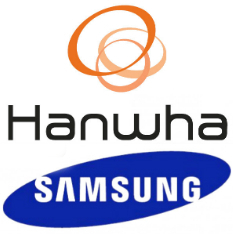 Lol, Samsung's brand > Hanwha's brand. That's the power of branding. It takes a lot to decay a brand. Note: I am not saying this as a statement of who has better products just simply that Samsung has such a huge lead in name recognition over Hanwha that even such an event doesn't close the gap. With all the heat that Hanwha taken over the branding change, even if deservedly, I see no reason to deny them this small schadenfreude. Yes, it is unfortunate that opinions, as uneducated as they may be, trump value. Losing a top consumer electronics brand and gaining ownership of a $55 billion company heavily engaged and invested in security is a win for Techwin and all their partners. Education, relationships and top value will trump brand name loss over time. Often in business, you need to take a step back in order to catapult forward. One of my friend is CCTV installer, he said to me that the brand power is nessesary but not enough factor for business. He said one episode; during installation there are many problems but nobody response for his phone call except Hanwah. It means that even Hanwah loses Samsung brand, the infra-structure is same. and the competency of Hanwha will be re-covered very soon. Stop trying to spin it. Brand matters, and I say that as a general marketing critic. Samsung is one of the top brands in the world, not in video surveillance, the whole world. Hanwha sounds like the name of the Chinese spam companies. It is going to make a difference to a lot of buyers. Let's say the infrastructure is the same. The reality is that Samsung Techwin video surveillance has been a solid player at best. They / You have never been the most innovative or fastest to market or lowest price, etc. To be clear, I am not saying Techwin video surveillance is bad, it is simply not so incredibly strong that it can shrug off losing one of the world's most recognized brands. Hanwha needs to commit to significant investment in video surveillance (either / or marketing, development, acquisitions) if it hopes to counter the negative impact of losing the Samsung brand. As someone who was long in the market of purveying surveillance products of Samsung, the change of ownership has severely crippled our pursuit of pushing those products as a lead product. We tend to push Axis now, and when the feedback is that the product choice seems excessive, we bounce back with Hanwha or other. I would also like to point out that I do not enjoy having to constantly defend my choice of Hanwha because it is a solid product. The name in the mind of 99.9% of anyone out there is CHINESE product. We are still marketing and selling them as "Samsung cameras". They are still shipping with the Samsung name on the camera/DVR boxes. They did a 2017 color update to their shipping boxes and they all still Samsung and Wisenet in the top right corner.